FDR and the "Broozle Effect"
There is a well recognized psychological phenomenon coined by Beverly Houghton in 1979 known as the Woozle Effect that arose from a story in chapter three of A.A. Milne's Winnie the Pooh, first published in 1926. (For more information see the wikipedia entry for "Woozle Effect".) As the story goes, Winnie and Piglet nearly catch an imaginary character known as a woozle after finding its tracks in the snow. In their pursuit they unknowingly go around in circles and mistakenly confuse their own tracks for those of the woozle, using this as evidence for its existence. The "woozle effect" has come to mean a conclusion based upon unreliable information that is accepted as truth. Perhaps the most unfortunate example in recent times is the now discredited work of Dr. Andrew Wakefield, a British researcher who allegedly found a link between autism in children and the presence in certain vaccines of a mercury containing chemical known as thimerisol. Before Wakefield was debunked, countless desperate parents' refusal to have their children vaccinated for common childhood diseases such as measles brought about a recurrence of the disease, a number of the cases resulting in fatality. To this day, this woozle is still regularly popping up in pediatricians offices. 3) and unequivocally stating that he first examined FDR in late March 1944, prior to which time there was no suspicion of serious heart disease. All of this was a diversion to deflect the fact that FDR was being treated for a number of malignancies (prostate, melanoma) that made a tangible contribution to his being labeled "The Sick Man at Yalta" in February 1945, and indeed was the primary cause of his death. The first historian to buy into Bruenn's deception was James MacGregor Burns in his 1970 Pulitzer Prize winning biography "The Soldier of Freedom". In his defense, Burns had no reason to believe he was being deceived. 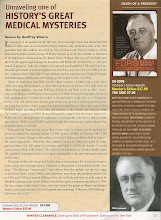 Virtually every subsequent FDR biography has echoed Burns' supposedly authoritarian conclusions. Since Bruenn's was clearly an intentional deception, it does not fit perfectly with the present definition of a woozle effect, Therefore, I am now coining a new term, one that arises from an intentional deception that goes on to become gospel, the "broozle effect." Harry Goldsmith was the first to be confronted with the "broozle" in 1979 shortly after he published the first peer-reviewed medical paper about the possibility of FDR having melanoma. Bruenn himself disputed Goldsmith's ideas. Since 2010, after my book and four papers in peer-reviewed medical journals were published, the original "broozle" has been the obstacle major that I have confronted in a challenge to gain acceptance of the truth about FDR's health. My thanks to James J. Kimble, Ph.D., Associate Professor of Communication, at Seton Hall University for making me aware of the Woozle Effect.